Everyone seems excited with the new Amazon Android Appstore launched last week. The real attraction seems to be the “one-free-app-per-day” policy of the Appstore. Keeping that aside, you have one more reason now to download free apps or buy a commercial one from there. 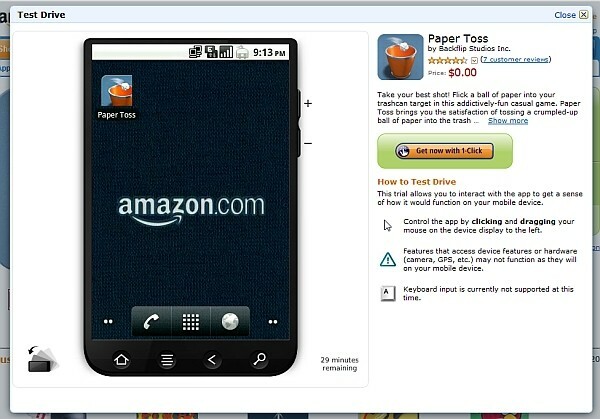 Now Amazon Appstore is providing a virtual Android machine/simulator in which you can try that app before you decide to put it on your Android phone. Amazon is surely harnessing the power of its EC2 cloud services here. There are only about 20 games and apps on the Appstore with this functionality including Amazon MP3, IMdb, Paper Toss and such. But even for some starter apps this feature is a killer one. This move, being just another marketing strategy, will prove to be really fruitful in the long run. And yes, if you’re not in the US now and want to try out Amazon Appstore app on your Android phone, here are the instructions for you. So, go ahead and take a spin yourself.